Waltari is a musical group from Finland. Waltari is known for its diversity and combination of music styles, frequently combining punk, pop, heavy metal, rock, electronic, funk, progressive rock and rap. It is this diversity, as well as singer/bassist and band co-founder K?rtsy Hatakka's extremely distinctive voice, that gives Waltari its unique sound. Most of the band's music is written by Hatakka. Waltari's lyrics often deal with personal feelings of anxiety, loneliness and the cruelty of the world, often with heavy irony and sarcasm. Most of the band's music is written by Hatakka. Waltari's lyrics often deal with personal feelings of anxiety, loneliness and the cruelty of the world, often with heavy irony and sarcasm. The name Waltari is a reference to the popular Finnish author Mika Waltari, a favourite author of guitarist Jariot Lehtinen. Waltari was formed in 1986 in Helsinki, Finland, by K?rtsy Hatakka (vocals and bass), Jariot Lehtinen (guitars) and Sale Suomalainen (drums). Sami Yli-Sirni? joined as second guitarist in 1989, a year after the release of their first EP, Mut Hei. Their first album, Monk Punk was released in 1991. As the title suggests, this album was mostly punk. Their next album Torcha! (1992) and it was with this album that Waltari started blending various musical styles into the sound that would become their own. After releasing a compilation of early work under the title Pala Leip?? (1993), the band went on to release So Fine! (1994), an album similar to Torcha!. Their next album, Big Bang (1995) is to date their biggest success. The album concentrates on mixing techno with heavy metal. In 1995 Roope Latvala (current second guitarist of Children of Bodom) joined the band, replacing Sami Yli-Sirni?. During this time, Hatakka was working with conductor Riku Niemi on a project combining heavy metal with classical music. This project eventually became known as Yeah! Yeah! Die! Die! Death Metal Symphony in Deep C. The show was performed in 1995, and the album was released in 1996. 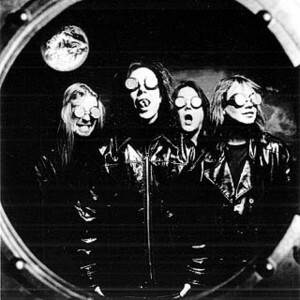 The year 1997 saw Space Avenue, a more progressive work containing more electronic drums, as well as a collaboration with Apocalyptica. In 1998, in honour of the band's ten-year anniversary, the band released a compilation titled Decade. In 1999 Hatakka was working on yet another metal/classical collaboration, and this gave rise to the stage show Evangelicum. This production differed from Yeah! Yeah! Die! Die! in that it contained more than just music: the stage show contained music, ballet and a light show. An album of Evangelicum was not released. Waltari's next album Radium Round (1999), featured a strong pop influence. After Radium Round, the band passed out of the public eye, working on less main-stream releases such as the Metal / Yoik crossover Channel Nordica (2000) and the punk EP Back To Persepolis (2001). However, these releases were very hard to obtain, and for a while Waltari only survived through its live shows. In 2001, the band's old guitarist Sami Yli-Sirni? returned, and Roope Latvala left the band. In 2004 Waltari came back with an all-new studio album, Rare Species. The album was well received by critics, and an extensive tour put Waltari back on the map. Waltari released their newest album called "Below Zero" in fall of 2009.